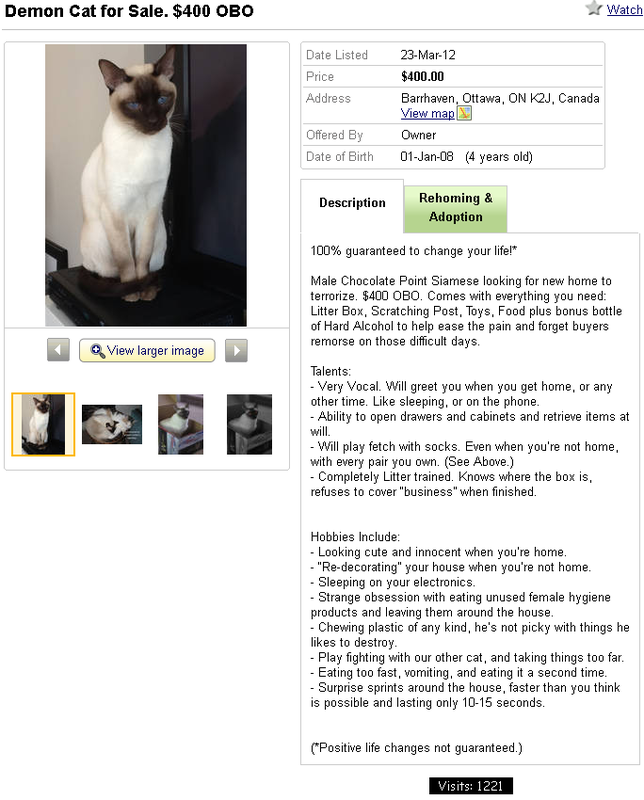 FYI, this cat is not actually up for sale. The owner apparently is an attention whore, and I don't mean that in a bad way. 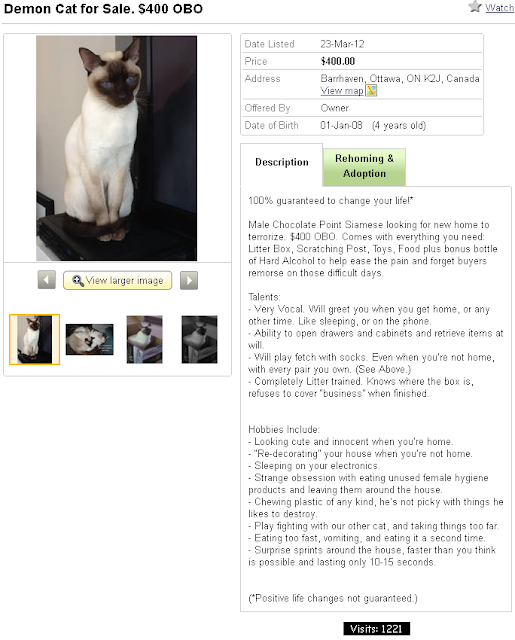 Male Chocolate Point Siamese looking for new home to terrorize. $400 OBO. Comes with everything you need: Litter Box, Scratching Post, Toys, Food plus bonus bottle of Hard Alcohol to help ease the pain and forget buyers remorse on those difficult days. - Very Vocal. Will greet you when you get home, or any other time. Like sleeping, or on the phone. - Ability to open drawers and cabinets and retrieve items at will. - Completely Litter trained. Knows where the box is, refuses to cover “business” when finished. - Looking cute and innocent when you’re home. - “Re-decorating” your house when you’re not home. - Sleeping on your electronics. - Strange obsession with eating unused female hygiene products and leaving them around the house. - Chewing plastic of any kind, he’s not picky with things he likes to destroy. - Play fighting with our other cat, and taking things too far. - Eating too fast, vomiting, and eating it a second time. - Surprise sprints around the house, faster than you think is possible and lasting only 10-15 seconds.